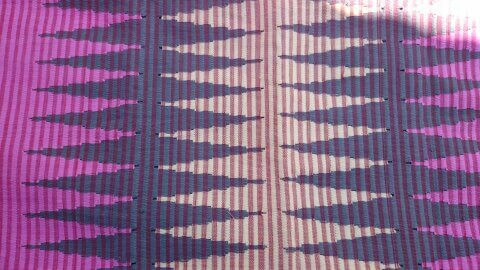 Rangrang fabric is a traditional woven fabric with bright colors and motifs made by traditional looms, by most residents in the pekraman village of Karang, Pejukutan Village, District of Nusa Penida, Klungkung Regency, Bali. The activities of making traditional weaving was done in a household scale, with the aim of preserving the heritage, religious needs, customs, and to meet the basic needs. 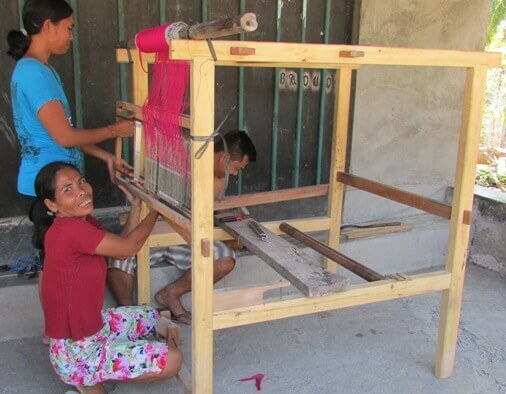 The making process of Rangrang fabric has turn into a side job (even the main job) of the local, in addition to the basic livelihood which they already had as field farmers and seaweed growers. The main materials used in the manufacture of Rangrang traditional hand woven are yarns and dyes. The yarns might come from natural fibers or synthetic fibers. As for the dyes, the majority uses the natural dyes that available in the garden or field of the residents. The natural dyes that offered by nature are in the form of leaves, fruits and roots. These are includes the leaves of indigo (tarum), teak leaves, turmeric, the tree bark of cashew, mango, jamblang, and others. The use of dyes from natural materials taken from nature is a wise option in reducing the adverse impacts on the environment and the availability can be maintained in nature. This is in accordance with the concept of Tri Hita Karana. The making process of Rangrang begins with yarn processing, dyeing process, the yarn preparation on the looms and the weaving process itself, including setting motive. The loom that used is a traditional looms (ATMB or non-machine), better known by local residents as "cag-cag". Such as the weaving process in general, the yarns which has been dyed will be compiled on a loom which is divided into lungsing yarns and weft yarns. Lungsing yarn is arranged in parallel, elongated, and does not move (static), with a width adapted to the size of the desired fabric. While the weft yarn wound on a particular device, is inserted transversely to the lungsing yarn (dynamic). The unique combination of lungsing and weft will creates beautiful motive and lovely colors on the woven fabric. The motive on rangrang fabric is divided into "edges motive" and "main motive". The edge motif appears in the form of triangular shape and often called a mountain motive. While the main motive lies in the middle part, covers: diamond motive (rhombus), "iled" motive (zigzag), "bianglala" motive (rainbow), lines motive, "porosan' motive, "gablag" motive (diamond motive with large size), "sirang" motive, spurs motive and cross motives (the letter x). 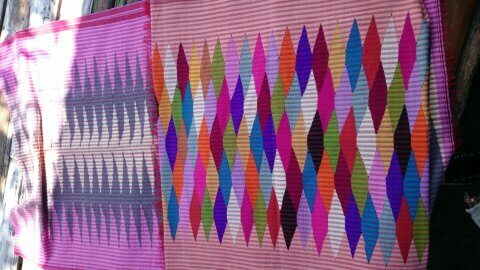 Rangrang fabric is dominated by bright and beautiful colors like red, orange, purple, yellow and blue. In the fabric sheets there are appears small slits serve as "air permeability", to allow air to pass through it. The marketing process of Rangrang fabric is done by selling it to the collectors, and then the collector will sell it to the consumers. 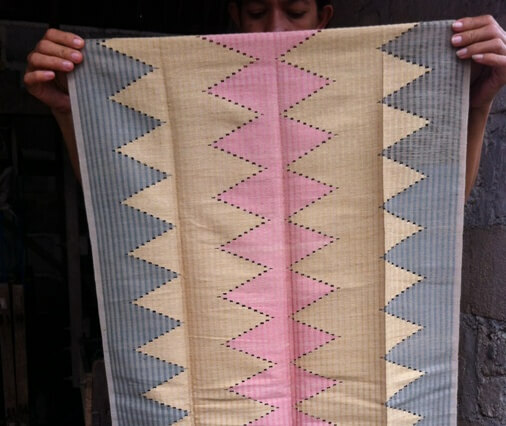 Locals only do the weaving process and the rest is done by collector. 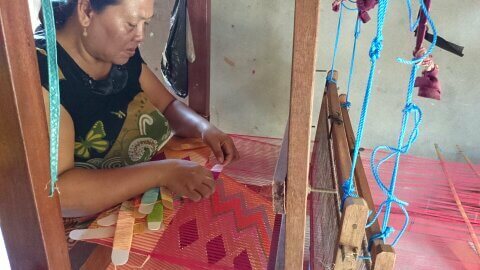 But, some weavers in Pejukutan Village sell it directly to consumers who come into their activity place. Rangrang and other traditional woven fabrics such as: endek, cepuk, poleng, keling, geringsing, and songket have been renowned worldwide. For the Balinese, these woven fabrics are not just a piece of plain cloth, but the medium which represents the power of the universe also its manifestations and become the center in the ritual. This traditional hand woven fabric is greatly adored not only by domestic people but also international. In the hands of experts, rangrang fabric is transformed into gorgeous clothing and amazing artwork. Really worth having!